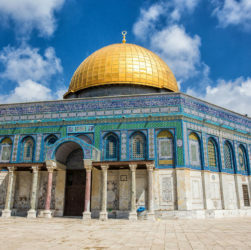 The most universally recognized symbol of Jerusalem is not a Jewish or Christian holy place but a Muslim one: the Dome of the Rock, or Qubbat as-Sakhra as it is known in Arabic. When people see its golden dome rising above the open expanse of Haram as-Shareef, they think of only one place in the world. The Dome of the Rock is undoubtedly one of the most celebrated and most remarkable monuments of early Islam, visited every year by thousands of pilgrims and tourists. It is Jerusalem’s answer to Paris’ Eiffel Tower, Rome’s St. Peter’s Square, London’s Big Ben and Kuala Lumpur’s Petronas twin towers; dazzling the minds of Muslims and non-Muslims alike. The Dome of the Rock is Jerusalem.